Brown Mackerel Tabby and White Male Bad Moon Rising aka "Homer" was bred and owned by Diane Krakoff and Kathy Erario. His only litter is the litter that included Ace. 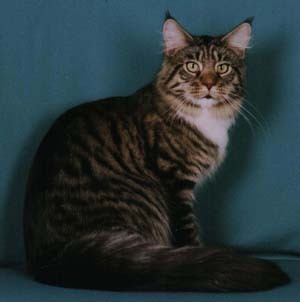 A brown mackerel tabby female from this litter, CH BlueBlaze Meridian of StarryNights, is a part of the StarryNights breeding program. Thank you, Diane & Kathy, for letting us breed to this wonderful boy.